As required by both the 14th Amendment to the US Constitution and the Missouri Constitution, every ten years after the census, Missouri’s legislative districts are redistricted to maintain populations that are as nearly equal as practical. As required by the US Voting Rights Act, no plan for reapportionment may dilute the black vote and deny black voters the opportunity to elect a representative of their choice. In order to have an opportunity for black voters to elect a representative of their choice, districts should be drawn, where possible, at least 50% black; provided however, that based on lower black voter turnout, lower black registration rates and a younger aged black population, vis-à-vis white voters, courts have found generally that a district must be 65% black in order to give black voters the opportunity to elect a representative of their choice. Thus, in drafting districts, drafters should strive to draw the maximum number of 65% majority black districts possible. 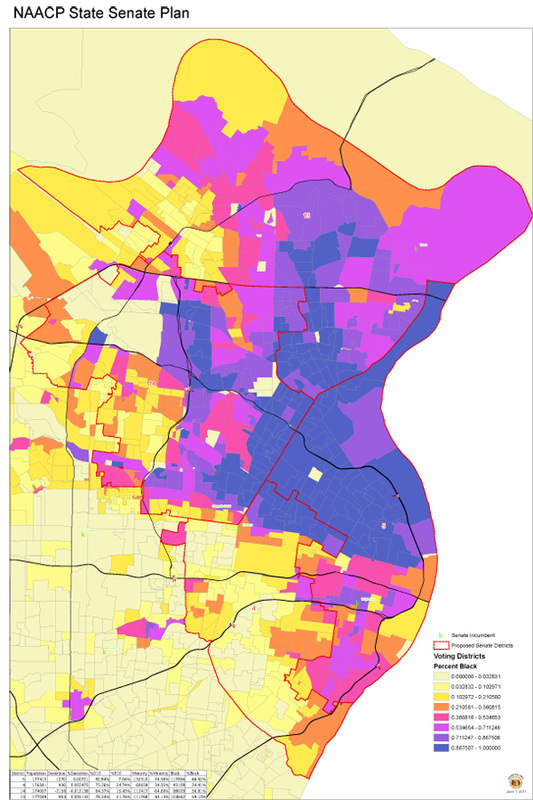 After the 2000 census, the Missouri state senate was redistricted in such a manner as to retain the one majority white, 1st district, and the two majority black, 4th and 5th districts, respectively, within the city of St. Louis; however, due to the overall level of black population in the city of St. Louis, the 4th and 5th districts were only 54% black, respectively. The reapportionment plan also retained 60% majority black populations in the 14th district of St. Louis County and the 9thdistrict in Kansas City, respectively. Moreover, a second district in St Louis County, the 13th had a 48% black majority, which was expected to become 60% majority black over the next ten years. That has turned out to be true in that the 2010 census shows the 13th district to now be 61% black, and the 14th district is now 59% black. The 9th district in Kansas City is currently 66% black. In the city of St. Louis, the 4th district is now 53% majority white and the 5th district is 52% black. The state of Missouri had an overall increase in population, but St. Louis City had a substantial loss of black population, that will result in the loss of a majority black state senate district within the city of St. Louis. However, the black population moved from St Louis City to St. Louis County, and, as a result, the majority black state senate district moved from St. Louis City to St. Louis County; and thus overall, for the state of Missouri, there has been no loss in majority black state senate districts. The St Louis Branch of the NAACP has formed a committee to advocate the voting rights of black voters in the St. Louis area, in the reapportionment process, and has presented a reapportionment plan to the Missouri Senate Reapportionment Commission that preserves the three majority black state senate districts in the St. Louis City-County area. Under the NAACP plan, the 13th will be 59% black and the 14th will be 57% black, which is the maximum black populations possible in those districts based on the total black population in St Louis County and its location. In the City of St. Louis, the 5th district will be 66% black. It has been reported that some commissioners propose to change (“Crack’) the 61% black 13th district to a 51% majority white district in violation of the US Voting Rights Act. Fortunately, the sole black commissioner on the Missouri Senate Reapportionment Commission, former State Rep. Terry Riley (D-KC) has staunchly opposed any plan to dilute (“Crack”) the black vote in the 13th state senate district. The NAACP would urge the Missouri State Senate Reapportion Commission to comply with the US Voting Rights Act and to assure that black voters have the opportunity to elect a representative of their choice in the 13th district as well as in the 5th, 9th and 14th districts.